If you know me at all, you know that besides making pottery, I love to cook and I especially love to make pasta. In my spare time I watch repeat episodes of Pasta Grannies, Vicky Bennison’s show that joyfully documents Italian women making pasta by hand (on Youtube—if you’re not watching it you are missing out). Early last year I was scrolling instagram when I came across a gorgeous pasta making tool called a cavarola board. I’d never seen one before—a flat board, with a delicate surface pattern, elaborately carved with diamonds, dashes and dots. The surface texture looked like terra cotta to me, and I was intrigued. After some research I realized they are actually made of wood (there is a great post on Steve Sharafian’s blog A Serious Bunburyist about the cavarola board and some of the pasta made with it) . But the end, my misunderstanding had brought me down a path—that I should make my own boards, and why not make them from clay. Porcelain, with its smooth, easy-to-carve surface and its vitrified (sealed when fired) properties seemed like it could actually be ideal. I made myself a crude slab board to try it out and loved it for rolling garganelli and even patterning the edges of my ravioli. The added textures creates a way for the sauces to grab onto pasta. After I carved the rolling surfaces, I realized the other side was a perfect painting surface—the finished pieces remind me of the thick tiles I have often admired in Italian ceramic and antique shops. I added holes to each board so they can be hung on the wall when they are not busy rolling garganelli, cavatelli, malloreddus or any other sturdy handmade pasta that benefits from a grooved surface. 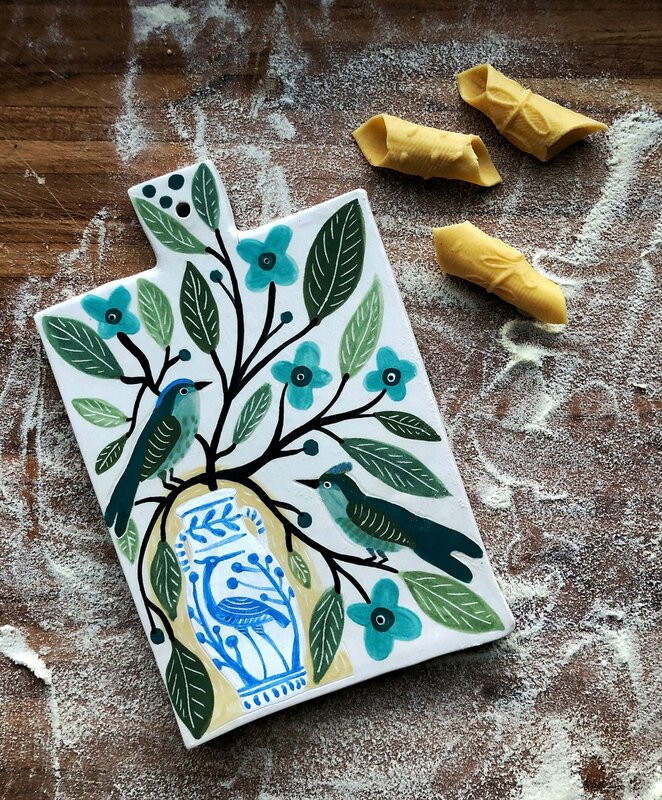 Since they’ve come out of the kiln, I have been making pasta all week, testing the various patterns to see where I go next—and I cannot wait to make more boards (a few other ideas for pasta tools are brewing as well—corzetti stamp coming soon). I’m looking forward to putting these boards out into the world and hearing(and seeing ) how they go. And I’d love to hear about other pasta forms and tools, please do tell me any you think I should know about. When I built this website, I thought I might like to add occasional posts...so stay tuned, I may.